RJR Real Estate Group was founded in 2002. As the firm has grown and diversified, RJR Real Estate Group has partnered with other businesses related to residential real estate, consulting, investment and development, to become one of the most diverse real estate brokerage firms in the Carolinas. The core focus of the RJR Real Estate Group has always been serving the residential market place. Our team of Specialists is known for their expertise and professionalism. 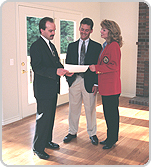 The Broker-In-Charge of our firm has been a top producing Broker in the Charlotte Metro region for many years. RJR Real Estate Group not only assists property owners in the marketing of their properties, but also serves residential home buyers, owners and investors. Recently, the RJR Real Estate Group participated in the opening of a Carolinas Division of The Hogan Companies. The Hogan Companies currently averages more than $100 million in annual sales, and has been responsible for over $1 billion in real estate transactions. This relationship has enabled RJR Real Estate Group to offer services from a leading commercial sales and leasing brokerage. Commercial real estate brokerage has become an important component of the RJR Real Estate Group' array of services. No matter how large or how small your real estate needs, the experienced team at the RJR Real Estate Group will provide you with unparalleled performance and results.